Recently I was at the Abu Dhabi airport waiting for the announcement of my flight to Mumbai and across from where I was sitting, I saw a bakery and patisserie shop showcasing what looked like colourful Easter eggs. And the sight of these delights took me down memory lane to those days when I was working with the Centaur hotel in Mumbai. Come Easter and we would all gear up to create a variety of Easter eggs – a simple yet delicious concoction of dark and white chocolates, cocoa butter and toffees. Last year during Easter, I was invited to visit the kitchens of the White House in the US by its Executive Chef Bill Yosses. I was accompanied by Pastry Chef Anil Rohira and Chef Vinod and we had the opportunity to see the making of a mammoth Easter Egg by Chef Yosses and his team. What an experience that was! Simply awesome! Back in India, this year we are gearing up to celebrate Easter with Alyona’s family at Pune on 31st March which has been marked as Easter Sunday. Alyona’s sister Vandana, who is married into a Catholic family and residing in Australia, will also be joining us for this grand Easter celebration. No Easter celebration is complete without the popular Easter Egg hunts. I remember the Easter egg hunt that Vandana had organized in her home in Australia, a few years back. It was so much fun, not only for the children, but for us elders too. Beautifully decorated Easter eggs, sold in stores were gifted to children by their parents. According to the tradition, parents hide these Easter eggs along with sweets and the children have to find them. My kids are also eagerly waiting for us to organize this. Alyona is thinking hard to find interesting and not-so-easy-to-search places for hiding these eggs. And of course, you can imagine what this means for me! I have been commanded by my children to create a basketful of Easter Eggs, which are not only visually impressive but innovative in its taste as well. Plus my famous buttered hot cross buns and their favourite Blueberry buttermilk cup cakes is also on the to-do-list. Apart from these, I am also going to order some cakes and other Easter goodies from Bunty Mahajan’s Deliciae Patisserie and Hearsch Bakery, both located in Bandra. They make some of the yummiest Easter cakes that I have ever eaten. Though I have made hundreds of cakes, I am a bit partial to their cakes, especially around Easter. Most Catholics have their own secret Easter recipes, which they share willingly if someone is interested. In Bandra, which is a hub of the Christian community, one can also buy from one of the innumerable small Christian bakeries hidden in the by-lanes of Pali Hill, which serve the most incredible baked treats. So you can easily fill your Easter basket with rich Simnel cakes, delicately crafted chocolate eggs, yummy Easter bunnies, scrumptious hot cross buns and mouth-watering carrot cookies. Some places also serve a grand Easter feast consisting of chicken and lamb specialties as well. But if you want to get a bit adventurous and surprise your family, you are most welcome to try out these Easter specialties on my website as well at www.sanjeevkapoor.com. It’s not freezing like the Northern India, but I’m sure we all are feeling that major drop in the temperature…Mumbai has really become cold this year, in a long time to come. Call it the global warming or whatever other reason, these chills are like never before and are giving that perfect winter feel in and around this region. Don’t miss on all those super and palate-tickling winter foods and make the most out of them…enjoy and stay warm! Of the usual stuffs, Master Chef India Season 3 shoots in Karjat for me, are at a halt for sometime as I had to fly to Dubai on Tuesday for the opening of the second Options Restaurant at Movenpick Hotel in Deira, Dubai. The first one was a successful launch and I wish, with the second one too, I get to attend and launch many more of my restaurants world over. Always keeping my fingers crossed for the best! While in office, its shoots and trails doing the rounds amidst the renovation of Alyona’s and my cabin. The work is taking pace slowly and I’m too excited and waiting eagerly for my rooms to get made-up in the all new avatar! Besides this, Youtube shoots are on with Anupa Das making cooking very simple and easy for beginners. The series have already begun and there are many more to come. I hope these tips and tricks are proving handy to all those who are first-timers or have had that skeptical feel about cooking. No need to worry any further, just log on to ‘sanjeevkapoorkhazana’ on Youtube and check the ‘Recipes for Beginners’ by Chef Anupa Das like roti, chawal, subzi, dal, chai and all such basic things. Don’t delay any further! 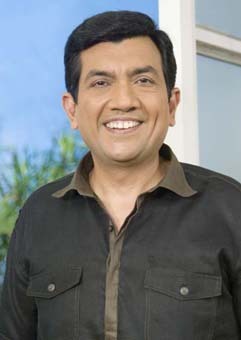 Also, trials for new recipes to go on www.sanjeevkapoor.com are almost over with the second schedule. Watch out for these unique dishes on the website – soon to be uploaded! 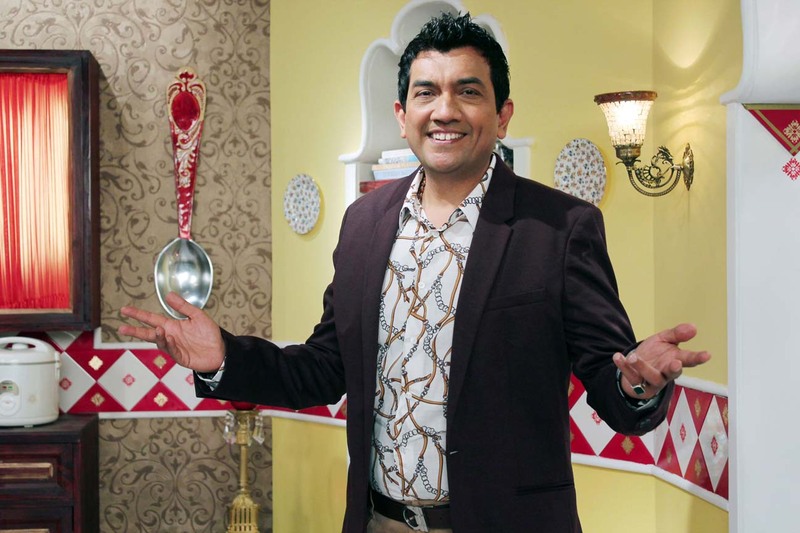 FoodFood’s Style Chef and Mummy ka Magic shoots are also scheduled to begin in the coming weeks, so the Channel is busy with the preparations and recipe research and development for the same are on. Just a few days back when I returned from an exhausting trip to Dubai, Alyona asked me what I would like to have for dinner and I told her, without wasting any time on thinking about it, that I wanted a bowl of hot Chicken and Sweetcorn Soup with some toasted garlic bread. To me soups are the best comfort food. I slurp on a bowl full of soup when I am tired, when I feel I need to give my stomach rest from a heavy meal, when I feel low and also when I feel at the top of the world. Soups have the knack to placate me whatever the mood I may be in. It’s the best comfort food which is both wholesome and nutritious at the same time. The best thing about soup, I find, is that it can be prepared easily and does not need much skill. What’s more you can make a soup out of anything – leftover vegetables or pieces of meat or fish or a combination of two or more of these. Just put together a few things in a big pot, add sufficient water or stock and let them simmer away till well cooked. And while the soup pot is bubbling away you can escape from the kitchen and do something else – watch your favourite show on the TV or listen to music or read a book. The amount of water can be altered according to your need – add more liquid if you want a thin soup or less liquid if you want a thick soup. Add seasonings as per your taste and ladle out bowlfuls. My personal favourite is Sour and Spicy Prawn Soup. If there is a bowl full of this soup and some pav to soak it up…just the thought is enough for me to feel satiated. Oh yes, you can make cold soups too. On a hot summer day when I just cannot think of piping hot soup, I reach out for a bowl full of chilled soup. Here too you can have a variety. Just the thought of Chilled Cucumber and Buttermilk Soup which is absolutely yummy and very cooling to the system too. Alyona and I do love to have some delicious Goan food once in a while and what better place to go than Goa Portuguesa owned by our friends Dr. Suhas Awchat and Deepa Awchat. Their first place opened long, long ago in Matunga and now, more convenient for us is the new joint near RTO, Four Bungalows, Andheri . We have been enjoying Goan food here in Mumbai for many years now – from the time the Awchats opened their first place. The Awchats have always claimed that it is a myth that Goan food is synonymous with seafood. They have researched well and can dish up to two hundred vegetarian dishes! What do I enjoy? Chicken Caldoverde and Creamy Soup with Spinach and Chicken with Garlic Bread. Local Mumbai Pav with generous portion of garlic and butter. Grilled Tiger Prawns, the prawns are so very fresh. I am told, Deepa takes personal interest in the purchase of fresh produce. With the Pomfret Recheiado in all its glory of red Goan masala on the fiery side, we also like the Chicken Xacuti with its exotic Goan spices in coconut gravy. For veggies, the Tender Coconut Cashew Sukke replete with juliennes of tender coconut and cashewnut cooked with onions, tomatoes and Goan sauce is worth writing home about. I have fallen in love with this dish so much that in my home it is cooked very often now. Simply divine. And, yes the Solkadhi – it is good!